William Thalken, 93, of Ceresco, formerly of Leigh, died Friday, February 9, 2018, in Lincoln. Mass of Christian Burial Tuesday, February 13, 2018, 10:30 A.M.
William Thalken passed away February 9th, 2018 in Lincoln Nebraska. Bill was born to Fred and Elizabeth (Huisman) Thalken on March 25, 1924, in rural Colfax county. 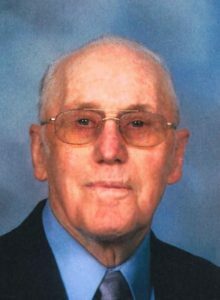 He attended a country school through 8th grade, then attended and graduated from Leigh High School in 1941. He played basketball, walking 5 miles to home after practice. He worked for area farmers until enlisting in the Navy in 1944. He served in the Pacific Theater, being stationed in Okinawa, Guam and Hawaii. He returned home on Memorial Day, 1946. He married Agnes Jelinek in Clarkson, Nebraska in 1949. They farmed southeast of Leigh, raising chickens, cattle, hogs and turkeys. They raised 10,000 turkeys a year for 10 years. They retired from farming and moved into Leigh in 2001. In 2010, they moved to Ceresco to be closer to all of their children and grand children. Bill loved building things. Every grand daughter received a cedar chest when they graduated from high school. In the last year, each great grandchild was made a wooden memory box. He made entertainment centers, 4 poster beds, waterbeds, tables, clocks and many more things too numerous to count for family and friends. He loved to “tinker” with things and take them apart to see how they worked or to get them working again. Sitting still was not in his DNA. He made many new friends in Ceresco at Senior Diners and at Ernies warehouse across the street from their house. He didn’t know a stranger. He talked to everyone. Bill was preceded in death by his parents, brothers Ben and Fred Thalken, brother and sister in law Raymond and Kathy (Farley)Thalken, sister and husband Helena and Ernest Koch, sister Bertha Thalken, and son Gary Thalken. He is survived by his wife of almost 69 years, Agnes, daughter in law Pat (Schlautman) Thalken of Lincoln, daughter and son in law Carolyn and Ron Hajek of Ceresco, son and daughter in law Ken and Laura (Pearson) Thalken of Ceresco, 8 grandchildren, and 17 great grandchildren and one sister-in-law, Emily Hastings of Columbus.